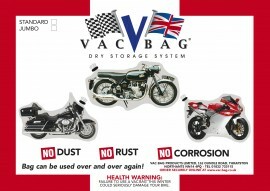 VAC-BAG® is an inspired ultimate bike storage solution. However, the unlimited uses for this dry storage product far outweigh it's initial concept. Any type of machinery or any metal items which needs storage, will benefit from the rust prevention packaging. 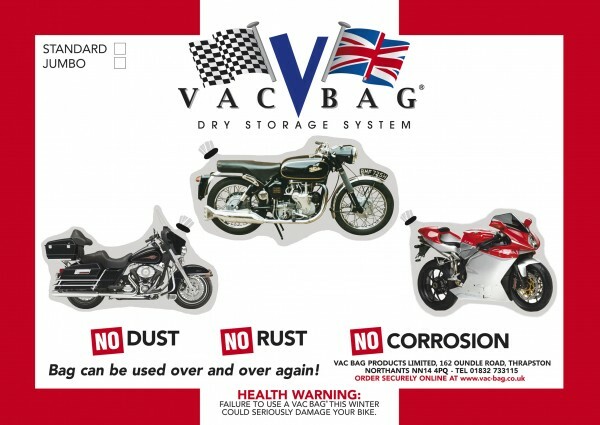 VAC-BAG® bike storage system provides a vacuum, corrosion prevention barrier which will keep your item like new including engines, bike parts, winter storage of dirt bikes but most of all, my passion classic bike storage making VAC-BAG® an ideal do it yourself indoor bike storage product. VAC-BAG® is a perfect storage solution for the garage, home or shed, to prevent corrosion for any period of time, a perfect gas tank rust solution. Protect your bike inside the VAC-BAG®, the ultimate motorbike storage system. When preparing the item for storage, it is a good idea to drain the petrol tank or run to a low level as petrol loses its volativity after a few weeks and it will also tend to gum up the fuel system. It is also a good idea to change the engine oil prior to storage as used oil becomes acidic and can corrode internal engine parts. Ideally the item should be serviced before storage and not after. Tyres should be inflated slightly above their normal pressure to ensure there is no pressure bulge where the tyres touch the floor. Batteries should be taken off the item and charged periodically. If an alarm is required then there are two ways of providing the power - run battery extension leads out of the bag to your power source, or leave the battery on the bike and connect to a battery charger that is outside the bag. If this system is adopted you must ensure that the charger does not gas the battery. A suitable charger is a Batterymaster. Clean the item and ensure it is dry, then place it into the VAC-BAG®. Insert the nozzle of your vacuum cleaner into the end of the bag to remove the air. Seal the neck of the bag. The item is now totally protected from the elements. Let the VAC-BAG® motor bike storage storage system take care of your bike this winter. Bike during VAC-BAG® vacuum storage cycle. "Here is the story of my "experiment" when using a VAC-BAG®. Several years ago I was living on an island in the Outer Hebrides. My house was sited close to the tip of a peninsular. This meant the property had the sea on three sides of it, resulting in damp salty air continually blowing at the house. You could almost watch metal items rust! I needed to store a Table-Saw; there was no room in the house and I had no out-buildings. Covering the tool with a plastic sheet wouldn't work; I'd tried this previously with a small concrete mixer which went on and rusted anyway. A VAC-BAG® seemed the ideal solution. To see just how good a VAC-BAG® was I thought I'd try an experiment. Some shiny new nails were sealed inside the VAC-BAG® along with the Table-Saw; more were put next to it and left entirely exposed to the elements; others were placed next to the saw and covered so that although they wouldn't get wet they could still be attacked by the damp, salty air. It was several months before I was ready to take the saw out of the VAC-BAG® ; when I did I was well impressed. The saw didn't seem to have deteriorated at all; the condition of the nails sealed in with the saw confirmed this as they looked like they'd just come out of a packet. Those nails left exposed to the weather were seriously corroded; parts of them had rusted away completely and several had been bonded together with rust. The nails protected by covering were also badly corroded but at least could still be recognised as rusty nails. This previous experience using a VAC-BAG® has left me in no doubt that this product is the best way for me to store my bike over the winter months."